Shortcodes are great, but they are not always the best way. One disadvantage of using a plugin or theme that relies on shortcodes is that when you switch a theme or deactivate the plugin, they will leave behind shordcode tags in your posts which will look strange to your readers. In this article, we will show how to find and remove unused shortcodes from your WordPress posts and pages. No, absolutely not. Shortcodes are not bad, but overusing them can be problematic. For example, we use Compact Archives plugin which provides a shortcode and a template tag. We have the shortcode only on our archives page, so if we ever deactivate that plugin, then there is just one page we need to remove the shortcode from. On the other hand, there are plugins and themes that provide shortcodes to create common style elements like buttons, tables, columns, etc. Some ad management plugins also use shortcodes. Now if a user has used these shortcodes in many posts, then it becomes very difficult for the user to remove the shortcode from all posts and pages. This is why we recommend our users to not rely on themes or plugins which require you to add shortcodes into many posts. You should always try to find a better alternative if you can, or contact the theme or plugin author. They might tell you a better way to get the same functionality without using too many shortcodes in posts or pages. In order to remove unused shortcodes from your posts and pages, you need to first find them. In this code, we have created a shortcode (how ironic is that?). The shortcode runs a function to execute a custom WordPress Query. In this query, we are using the default WordPress search feature to find the shortcode and then list all posts found with that specific shortcode. 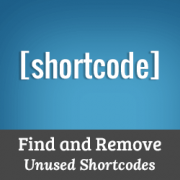 Replace myshortcode with the shortcode tag you are looking for. Save your post or page as a draft and then preview it. This will allow you to see a list of all posts containing the shortcode tag you searched for. Unfortunately, the best way to remove unused shortcodes from your posts is by manually editing each post containing the shortcode. In the method described above, we showed you how to get a list of posts containing a particular shortcode. Hopefully, this will save you some time. Once you have the list, then you can go through the posts one by one and remove the shortcode. You would need to replace shortcodetag with the shortcode appearing in your posts or the shortcode you want to hide. Basically the code above will add the shortcode and make it show nothing. This way your shortcode will be parsed as any other registered shortcode would, but without showing anything in the output. If there are multiple unused shortcodes in your posts, then you can reuse this code by just replacing the shortcodetag with the shortcode you want to hide. We hope this article helped you find and remove unused shortcodes from your WordPress posts or pages. For questions and feedback please leave a comment below. Thanks for this article. It helped me fix a big problem and save a bunch of time! I used this, but made one small change. I set the WP_Query to also look for any post type instead of just posts. What a tip! I’m moving a site from Canvas to Beaver Builder and this is just what I needed to find the Woothemes shortcodes without getting into the database. Easy. Thanks! I put this in my a site-specific plugin but got the above error message. please help. Hello, my website is and i used before the Shortcodes Ultimate plugin, but now i don’t use that plugin and i want to remove all shortcode from that plugin leave in posts. Can you tell me for any plugin twhich can find the unused shortcode and delete automaticaly? It would be helpful if you could also add how to bulk replace the old shortcodes found to the new shortcodes used in the new theme, rather than just removing. I think most people who migrate themes will be looking to replace like me. Regex replace plugin is useful but does not replace shortcodes in custom post types. So we still need some kind of bulk find and replace shortcodes solution. Does this method still work w/ WP 4.0.1? If the shortcode we wanted to find was pb_carousel group=”x” what would be the shortcodefinder to use? If the plugin is reactivated, should the shortcodes become functional again? Very helpful. But a simple Search Regex search finds the shortcode for me. That seems far less intrusive than editing the function file? This seems like it will be a really good idea to place in the plugin deactivation action, and not allow the user to deactivate the plugin until the shortcodes have been removed or just warn the user of which posts still have these shortcodes. Why not write a filter for the_content that runs a regex looking for all short codes in the post then checks their name against the array of shortcode hooks to see if it had any hooked functions and if not remove them from being displayed. Theyre still there but then readers don’t see them if you need to edit a lot of posts. You could put that same funcrionality in a plugin to list all posts with all unhooked shortcodes in one location so the user doesn’t have to know the exact shortcode name when needing to edit out unused shortcodes. Most of our beginner level users find it difficult to work with regex. We do not recommend our beginner level users to run direct SQL queries on their WordPress database unless it is critical. sorry i forgot to mention that we can get list all available shortcodesby global $shortcode_tags variable. i think there might be a way.as you used the loop to find post with shortcode we can take the id of each post and with some help from wpdb class and php regex probably the goal is achivable.